If you're on a mission for a casual yet totally stylish look, consider teaming a Stella McCartney ruffle one shoulder blouse with black fringe jeans. Both pieces are totally comfy and will look fabulous paired together. Make brown leopard suede pumps your footwear choice to instantly up the chic factor of any outfit. If you're on the lookout for a casual yet totally stylish outfit, rock a white ruffle long sleeve blouse with grey skinny pants. Both garments are totally comfy and will look fabulous together. Grey suede pumps work amazingly well with this ensemble. 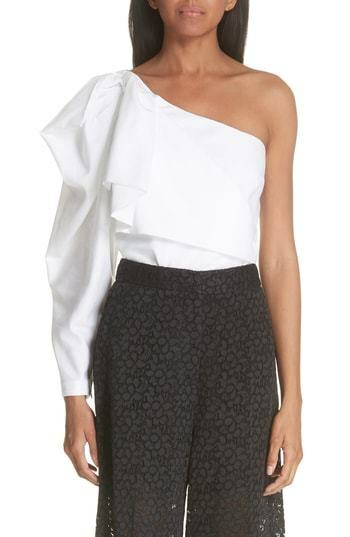 If you're searching for a casual yet stylish ensemble, make a Stella McCartney ruffle one shoulder blouse and black tapered pants your outfit choice. Both pieces are totally comfy and will look fabulous paired together. When it comes to shoes, this outfit is complemented nicely with black leather ankle boots. If you're hunting for a casual yet totally chic look, consider wearing a Stella McCartney ruffle one shoulder blouse from Nordstrom and black skinny jeans. Both garments are totally comfy and will look fabulous together. For a casually elegant look, pair a Stella McCartney ruffle one shoulder blouse with a pink pencil skirt — these pieces the office really great together. If you're hunting for a casual yet totally stylish outfit, pair a Stella McCartney ruffle one shoulder blouse with light blue jeans. Both items are totally comfy and will look fabulous paired together. When it comes to footwear, this ensemble is complemented wonderfully with red suede wedge sandals. If you're on the hunt for a casual yet totally stylish look, reach for a Stella McCartney ruffle one shoulder blouse and black skinny pants. Both garments are totally comfy and will look fabulous together. For the maximum chicness grab a pair of black leather pumps. For a casually elegant ensemble, consider teaming a Stella McCartney ruffle one shoulder blouse with a black suit — these pieces go pretty good together. When it comes to shoes, this getup is round off nicely with black lace pumps. 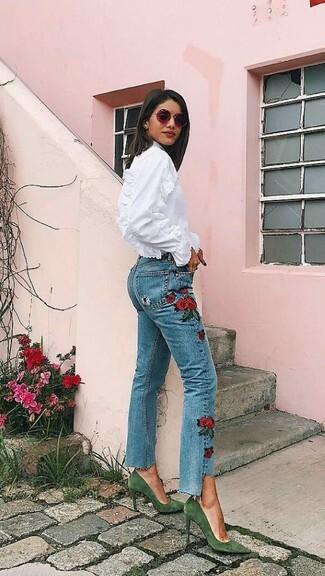 If you're in search of a casual yet chic getup, consider teaming a Stella McCartney ruffle one shoulder blouse with blue embroidered jeans. Both pieces are totally comfy and will look fabulous together. Let's make a bit more effort now and grab a pair of green suede pumps.